More than anything, Maya wants to discover something incredible. Her parents are scientists: Her mother spends most of her time in tropical rainforests, uncovering ancient artifacts, and her dad is obsessed with digging up mammoths. When her father gets invited by an eccentric billionaire to lead a team investigating a mammoth's remains in the Arctic, Maya begs to come along. Upon her arrival at the isolated camp, the mammoth is quickly revealed to be a fake, but there is something hidden in the ice—something unbelievable. Along with a team of international experts, each with his or her own agenda and theory about the mystery in the ice, Maya learns more about this discovery, which will change her life forever. Laura Quimby expertly mixes adventure, science, and wonder into a page-turning story perfect for middle-grade explorers. 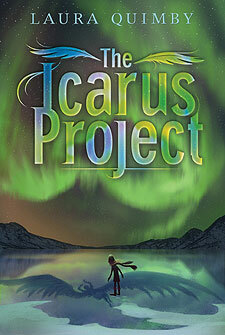 "...a fascinating journey of discovery, written through the eyes of a feisty and ambitious girl. Well told and atmospheric, this is a good read." "Who wouldn't want to find something earth-shatteringly unique while on an Arctic expedition?" Science teachers will especially like Maya. They can use the discovery in the ice to talk about scientific procedure and why it is important to keep good notes. I think it is great to have a book with a girl character who isn't boy-crazy. Yay for science minded girls..."